A fresh report published by Transparency Market Research (TMR) states that the global tumor ablation market is witnessing high competition owing to increasing fragmentation. The global tumor ablation market exhibit various prospects in the tumor ablation market. The company such as Medtronic plc. is one of the key players in the global tumor ablation market.The company growth mainly depends on its various product portfolio and this helps the company to gain prominence its various competitors. Some of the key players functioning in the global tumor ablation market are BVM Medical Limited, Sonacare Medial LLC, AngioDynamics, and Sonacare Medial LLC. The players functioning in the tumor ablation market are mainly focused in North America regions due to extensive healthcare facilities in the North America region. The revenue generated by the global tumor ablation market is anticipated to account for US$ 1949.5 mn by 2024 end. The global tumor ablation market is expected to grow at 12.2% CAGR during the course of forecast period from 2017 till 2024. On the basis of technology, the microwave ablation is likely to dominate the global tumor ablation market as it is one of the popularized technology in the healthcare sector. Less duration of therapy and minimum side effects of the microwave ablation makes the technology more preferred. However, it has been noticed that the radiofrequency ablation technology is dominating the market owing to increase in liver cancer case across the globe. Geographically, North America is projected to account for staggering share of 35% in the overall market in coming years. In addition, advancement in healthcare sector couple with awareness about particular technology to propel growth of the global tumor ablation market in the foreseeable future. 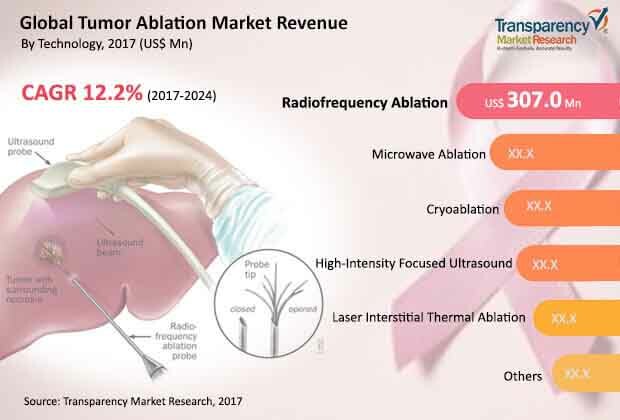 The global tumor ablation market is likely to register significant growth due to growing awareness among the consumers regarding the new line therapy for the treatment of cancer. Increasing public awareness about the cancer and growing supportive program by the NGO’s and government to supplement growth of the global tumor ablation market in the coming years. In addition, government is actively participating in several research related product to supplement growth of this market in the near future. Moreover, growing acceptance of several technologies is propagating growth of this market in coming years. Increase in elderly population is boosting demand for minimally invasive surgeries as these technologies helps in reducing the distress with quick recovery. This further fuels the demand for the minimal invasive process such as radiofrequency ablation associated to invasive processes. Furthermore, increase in disposable income in developing and developed economies helping the consumer to prefer progressive therapies over the conventional one. This is one of the key trend supporting growth of the global tumor ablation market in the coming years. On the other hand, the global tumor ablation market is likely to hamper growing owing to lack of awareness among the consumer regarding tumor ablation technique. The limitation of reimbursement policy likely to hamper overall growth of the global tumor ablation market. In addition, high expense associated with the product and research and development activities are another aspect limiting the market growth.